I used watered-down red and green food coloring in two awesome small spray bottles that were just the right size. 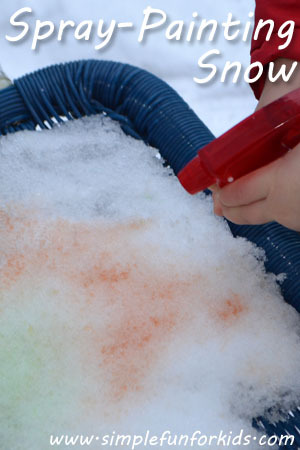 Still, I showed her how to turn the snow red and green, and after a while, she got the hang of it. She didn’t really go for the snow on the ground much, as it was much harder to hit because I hadn’t filled the bottles all the way. The snow on the lawn chair and table was fair game, though, although it seemed like she enjoyed spraying the frame of the chair most of all. Unfortunately, I forgot to check for colored icicles on the chair later. The very act of spraying is enjoyable to E, even without seeing tangible results. I should’ve put more colored water into the bottles, it would’ve made it easier for E to spray at a variety of angles. Inspiration: E has been very much into painting lately, so why not introduce a whole new type of canvas and turn it into one of her winter outdoor activities? It appealed to me that with this activity, E would be improving her hand strength, explore a new tool, learn about successful spraying, and make her environment more colorful, all at the same time. Have you spray-painted the snow before? Or painted it with a paintbrush? Tell me in the comments!